While implementing one of the requirements for View Criteria, I faced an issue when there was a request to filter View Criteria Item based on user language. Well, its trivial when you want to filter choice list defined for attribute - just specify bind variable value in View Accessor. Its a bit more tricky for View Criteria Item choice list, mainly because View Criteria can't access value from VO row. This means, if we want to filter View Criteria Item choice list, we need to use Groovy language script in order to retrieve value for View Accessor bind variable. In my case it was user language. 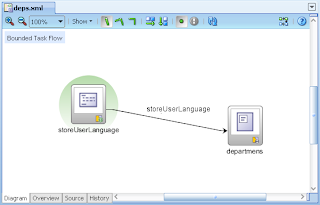 What I did - I have read Example #154 from Steve Muench blog - Not Yet Documented ADF Sample Applications, and decided to store user language in UserData map, in order to access it from View Accessor Groovy. If you will read Steve post, you will understand there are two approaches to access from your Model data available in ViewController layer. 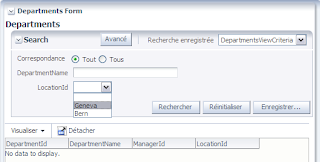 I prefer approach when UserData is set from custom Application Module method and then it can be accessed through Groovy. I need to use ADF BC with Stored Procedures and want to know which is the best recommendation to do that. Thanks. If your Stored Procedures dont have Table types, probably you can use just standard ADF BC functionality to call them. If Table types are used, will need to adopt JPublisher to generate Java objects for those complex types and then again to use with ADF BC API. 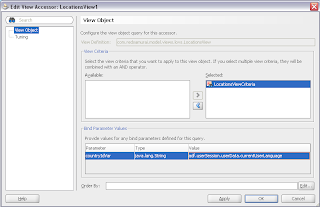 I found an exception when I try to apply the adf.userSession.userData.variable to my VO's Bind variable. in a common AM during user login. Then I will use it in other AMs as your example. Can I do that, or I have to assign the userData in each AMs individually? I didnt tested myself with different app modules. But I guess, you will need to store it in each module individually. Hi, Andrejus, please, I need to make debugging of the expresion adf.userSession.userData.currentUserLanguage, but I need know how get user session without groovy, i.e. programatically from initdefaults() in a EO class. It's really excellent blog. I tried to follow the same approach. Some how,getting null value with this.getSession in AMImpl. Please suggest if you have any clue on the issue. Otherwise value will be lost during passvation/activation for the AM.